General Dynamics‘ ordnance and tactical systems unit has received a $9.1 million delivery order to manufacture helicopter gun turrets for the U.S. Marine Corps and the government of Pakistan. 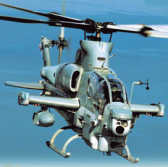 The order is for 41 A/A49E-7 (V4) gun turrets for integration onto AH-1Z attack helicopters, the Defense Department said Thursday. DoD noted the order comprises nearly $6 million purchase from Marine Corps and another $3.1 million purchase from Pakistan under the foreign military sales program. General Dynamics OTS will perform work in Williston, Vermont and Saco, Maine through August 2021.